Thread: Navy aircraft UK carrier will be sold after three years, no jets. What a really ignorant thing to say. Do you have any proof of this or are you just being an arse? I'd say it's more "look at the Union", I'd bet London and Cardiff are going to be named before long as well. A brutal assessment of the Royal Navy first published in the Official Journal of the Navy League of Australia and republished in a UK Defence Blog. "Unfortunately, renaming the Type 26 the ‘global combat ship’ does not actually make it any more ‘global’ or combat-effective than either its Type 23 predecessors or its foreign competitors. The GCS is merely the latest conservative and expensive frigate design to come down the BAE- Royal Navy turnpike, one that is as likely to be an export flop as every major British warship design has been since the Leander class frigates of the 1970s." Ah to be fair leander was bought by the dutch...And the Kiwis found that one of them makes an excellent diving reef.. The Indians and the Aussies built them as well. The last three Leanders in RNZN service were sunk as dive reefs. Good ships in their day. 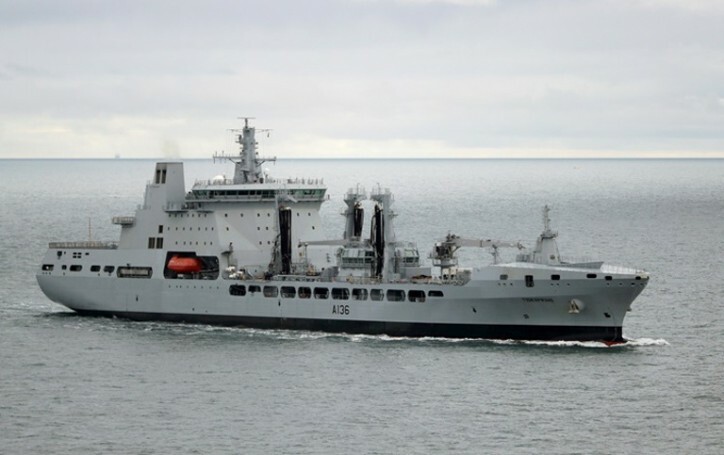 Meanwhile, the RFA has taken delivery of the new generation of Fleet tanker. GEâ€™s Marine Solutions (NYSE: GE) has recently successfully delivered its electrical power and propulsion system to the U.K. Royal Fleet Auxiliaryâ€™s (RFA) fleet of four Tide class Military Afloat Reach and Sustainability (MARS) tankers, which will deliver fuel and water to Royal Navy vessels around the world. â€œAs the next-generation class of large, fleet tankers, the Tide class replaces old single-hulled tankers and will enhance the Royal Navyâ€™s overall maritime capability,â€ said Commodore Duncan Lamb RFA, head of Afloat Support. As part of the hybrid propulsion configurationâ€”diesel engines coupled with electric motorsâ€”GEâ€™s technology enables the tankers to advance at the most efficient form of propulsion for each operational scenario. Designed for fuel efficiency, GEâ€™s electric motor can provide power to the propellers in addition to the propulsion diesel engine, which is used when higher speeds are needed. It can also conversely harness the power from the engine shaft to generate electricity and power the electric equipment on board when the tanker operates at moderate or low speeds. Using an electric propulsion motor powered by the shipâ€™s generating sets to run the propeller can save fuel, reduce emissions and reduce maintenance costs of the main engines since the generating sets are running to meet other electrical needs on the vessel. In addition to the design and engineering of the propulsion system, GE was also responsible for the commissioning of the GE-supplied equipment and training to the RFA for the switchboards and drives at its world-class Marine Power Test Facility in the U.K.
Did they ever explain the delays from the SK yard? Think it was something regarding the electrical systems. How long before this ends up in the MRV thread?? Well she is the bigger version of the Norwegian one isn't she? I see that the Type 26 is being promoted as a solution to Canada's quest for a CSC to replace the Halifax and Iroquois class (Some of whom have already become the main subject of a Sinkex). Will be stiff competition, up against already tried and tested designs, such as De Zeven ProvinciÃ«n class, FREMM multipurpose frigate, Fridtjof Nansen-class frigate and other designs that have the advantage of already having hulls in the water. Think the FREMM design got disqualified from the process for trying to go to the politicians to promote it. Surface vessels, are all the SSN's in port as well, the report seems to skip over that, though the RN issues are getting to the point that they can't be ignored. You can follow it live on the Facebook links. HMS QE is off to the east coast of the US in the summer - and some of her deck crew are already there - she'll be playing host to some USMC F-35's. Only man for the job! Former HMS Ocean now PHeM Atlantico and almost ready for her new owners in Brazil. Bearing the pennant A140. She will replace the Sao Paulo, the former french aircraft carrier FS Foch. More about the River Class batch II. Construction on HMS Forth began in October 2014 and she was accepted into the Royal Navy in February 2018. As we have reported on, soon after commissioning in April serious faults were discovered with here electrical system and sheared bolts were discovered with heads that had been glued back on. The ship has was quickly handed back to the care and maintenance of BAES and she has remained alongside the South West Wall in Portsmouth since. A thorough assessment of her material state and a plan for rectifications took a considerable time. 12,000 separate checks of systems had to be made but repairs are now nearly complete and she is on track to be handed back to the RN in November. Sea trials and then operational training will take place in the new year before she is permanently deployed to the Falklands to relieve HMS Clyde. Fortunately, the delays to HMS Forth have not had a huge impact on the RN as HMS Clyde has simply had her service extended by a few months. The problems with HMS Forth were a serious embarrassment for BAES, especially in the latter stages of its drive to sell the Type 26 design to Australia and Canada (fortunately ultimately successful). The quality control failures can be explained in part by the recent history of the Govan yard where she was built. HMS Forth was the first whole ship completed since HMS Duncan in 2012. In the intervening period, the yard worked on hull blocks for the QEC aircraft carriers. Although the blocks were complex in themselves, the systems integration, setting to work, testing and ultimate quality control was carried out in Rosyth where the ships were assembled. BAES has worked hard to introduce a greater focus on quality control and adjust to building complete ships again. The failures constructing HMS Forth are not easy to forgive but there is a definite benefit of sorts. Mistakes with an OPV are far easier to remedy than mistakes with Type 26 frigate construction. Lessons learned working on the OPVs will benefit the same workers who are moving straight on to the much more complex frigates. Construction on HMS Medway was started in June 2015 and she was named at a ceremony in Scotstoun where she has been fitting out since. After the problems emerged with HMS Forth, the ship was also very thoroughly checked. A single glued bolt head was discovered and other minor issues have been addressed. She will very shortly begin sea trials with a mixed Royal Navy and civilian crew off the west coast of Scotland. HMS Trent was laid down in Sept 2015. In March 2018 she was formally named in a unique ceremony while the ship was still out of the water outside the construction hall in Govan. She was subsequently floated out and towed to Scotstoun where she is currently being fitted out. Work began on HMS Tamar in Dec 2016 and she was floated out in early October 2018. With Medway and Trent already at Scotstoun, Tamar is being fitted out in the dock adjacent to the Govan yard. (Main image above) Her naming ceremony will probably take place in March 2019. It is interesting to note that by selecting the name â€œTamarâ€ it seems unlikely the RN would then name one of the Type 26 frigates â€œHMS Plymouthâ€, as many have called for. Construction of the final ship, HMS Spey began in Apr 2017. She is structurally complete and currently in the build hall at Govan under wraps undergoing the paint process which involves the application of five separate coats. She is scheduled to follow close behind Tamar with her naming ceremony planned for mid 2019. Today it's been announced that the 3 Batch 1 Rivers will remain in service for at least another 2 years and will be based out of their namesake cities, wonder had the RN budgeted in the manpower for them? They also announced an increase in Fisheries Patrols to 600 days a year. HMS Severn will be re-activated. Everyone is wondering where the crews will come from given the RN are struggling to crew frigates and destroyers.